I am falling in love with Copper. It didn’t happen right away. Â I was hesitant, resistant. Â But then it found it’s way under my hammer. The malleability of Copper hooked me. Â Then there are the colors. Â The pinkey orange when polished, black cherry/ash as it tarnishes with exposure to the elements of oxygen and skin, Â bright red of a borax patina, etc. etc. etc. The results of my attempts are never exactly the same. Â I can’t say I mind the surprises. 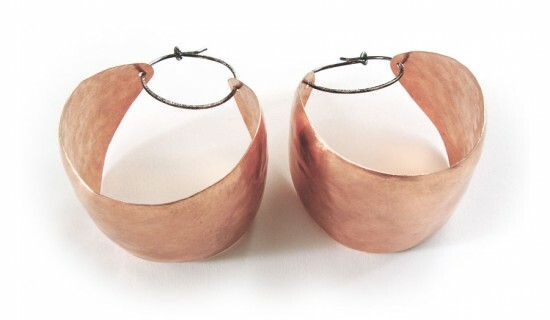 Â I made my favorite pair of hoops today with Copper. I’m not sure what to name them, yet. On second thought, I think I’ll name them “birthday hoops”.